Concep Send for Microsoft Dynamics CRM solution was designed to make your event registration management much easier. With our product you can have your event invitees list quickly created from your email marketing recipient list by setting your email campaign to generate campaign responses while sending. An Email Marketing Sender security role assigned to your Microsoft Dynamics CRM user. At least one Send Account assigned to your Microsoft Dynamics CRM user. A campaign created for your event. One or more marketing list with your event invitees added to the campaign. 1. The first step is to access the target marketing lists in your campaign. To do so navigate to the marketing area and click on “Campaigns”. There you can find and select the campaign you have created for your event. Once inside your chosen campaign click on the top menu and select “Target Marketing Lists”. 2. Select the marketing list(s) you wish to send your email campaign to and click on the “Send Email Campaign” button. 3. 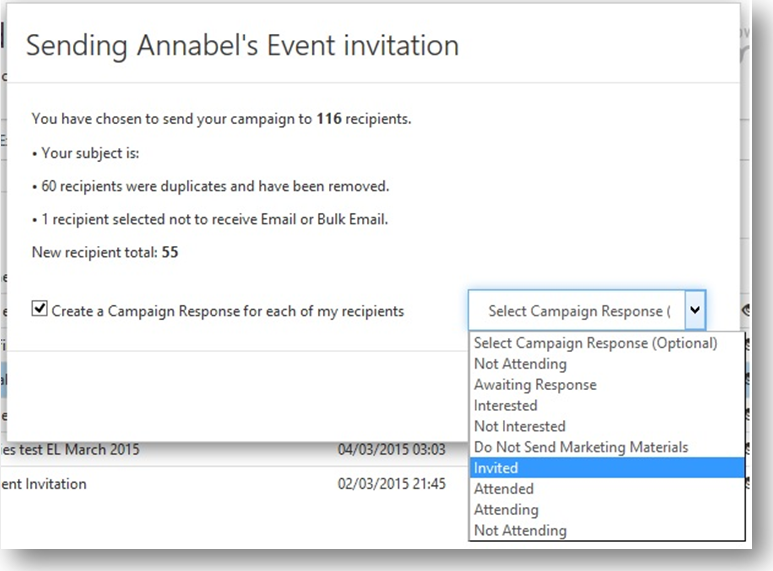 Select the email campaign you would like to send as your event invitation and click on send. 4. A pop up box will load to confirm your send request. In this pop up there will be an option to create a campaign response for each of your recipients. By ticking this box you will enable the drop down menu in which you can select the response code for the campaign responses. Press send and your email campaign will be sent and the campaign responses created. -The responses code label can be edited and new response codes can be added by your CRM administrator. This will be automatically updated in the drop down menu. 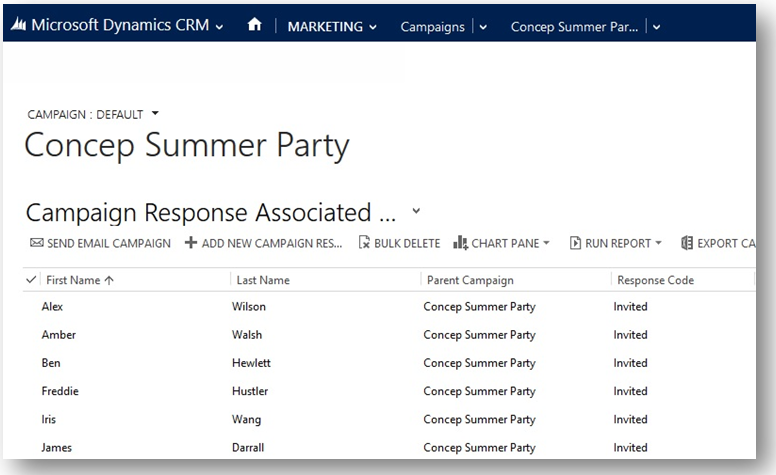 -“Campaign response” is the Microsoft default field for this entity. This name may vary depending on your CRM customisation. Our application will automatically use whichever name your company has set to the Campaign Response entity. 5. To see your invitees list open the campaign’s top menu and click on campaign responses. All the recipients of your email campaign will be listed with their response code set as configured in the previous step. You can use this functionality as many times you wish for the same Campaign. If your recipient already has a campaign response assigned the application will not create any new responses.